Thank you! This Fundraiser has ENDED! We'd like to first sincerely thank every single member who helped contribute in our Summer '16 Fundraiser. Whether you win a Giveaway or not, it is through the principle of your support that we will continue to move mountains in the name of SURGE revival. Using this link to the drawing, you will be able to verify your participation by entering your email address (as entered into our website, which is CASE SENSITIVE). Thank you again and SURGE ON fellow SURGE Fans! Welcome to our Summer '16 Fundraiser! The goal? 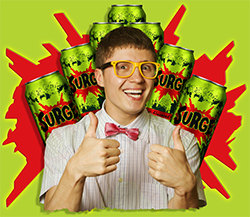 It’s up to all of us to get SURGE nationwide and to keep the buzz going. SURGE is not just another piece of nostalgia; it’s here, and it’s now. How do we plan to do this? Read below. Nearly half of our Movement's 338k SURGE fans were found as a result of Page Like advertising, but alas, the numbers have slowed for all of 2016 as our advertising budget ran short. We have a huge opportunity to get creative and spread the word of SURGE, whether it’s billboards, commercials, online advertising or other creative outlets. As a community centered on the success of SURGE, we can make anything happen if we work together. The most difficult long-term goal with SURGE will be to keep the name alive and relevant, and that stresses the key importance of growing our community numbers so we can continue to help work toward future sustainability and ultimately win the USA race for the Best Citrus Soda EVER CREATED! It’s time to campaign for SURGE’s future and to get it back on every single store shelf where it belongs. Let’s show the doubters what this brand can do when fueled by the ones who brought it back! ALL proceeds for this fundraiser go BACK INTO the SURGE Movement! Check back in here or at the SURGE Movement Facebook Page on Thu, Sep 22nd, 2016 at 10:00 PM ET for a list of all Giveaway winners. We'd like to "sincerely thank" every single member who helped contribute in this fundraiser. It is only through your support that we will continue to move mountains in the name of SURGE revival. Thank you and best of luck to each of you in the drawing! Tested only ONE time in its life for 30 minutes. You will not find a system in better condition without the use of a time machine! Comes with its original controller and all accessories. An unboxing may be streamed live in the coming weeks at the SURGE Movement. What better controller can help match that SURGE in your hand? Joystick is tight and ready for your late-night SURGE parties. Come on, there needs to be another controller that complements the SURGE color scheme. Joystick is tight and in excellent condition. Arguably the best Nintendo 64 game of all time! Includes game, original box with slight shelf wear, manual, and a 143 page strategy guide. Arguably the best Nintendo 64 First Person Shooter! Includes game, original box, manual, and inserts. Game is tested and everything is in excellent condition. Arguably the best Nintendo 64 Multiplayer Fighting game! Includes game, original box, and manual. Everything is in excellent condition. Officially licensed threads for the die-hard and the loyal. Every SURGE Super Fan deserves this shirt! With these brand new officially licensed and totally radical SURGE POGS, ALL of your friends are going to be jealous! You might just have to dust off your old fluro t-shirt, bust out your old metal slammers and get ready to party like it's 1997! Movement members have a mission, so why not offer some SWEET STICKERS to help them spread the word? With these brand new officially licensed SURGE stickers, you can stick them to your car bumpers, windows, laptops, or anything you put your mind to! This one-of-a-kind SURGE lighted sign measures a whopping 31" x 26" x 4". Perfect for any game room, bar, man cave, or the like! This legendary item comes straight from the '90s in brand new sealed condition! Better than the typical board game, you can now bust this bad boy out to test your modern day skills with a group of friends! Take on the new day with some '90s culture flair by wearing this officially licensed tie-dyed SURGE T-Shirt! Size is Large. Credit to the pictured '90s kid, SURGE Movement member Mark Olson who wishes he still had his shirt! Sport this vintage relic of a hat at any event to showcase your abounding passion for SURGE! Credit to The Coca-Cola Company for the SURGE to Moscow photo with Aaliyah who helped to promote the original "SURGE Around the World" contest. It's sunny out, so use this fantastic old SURGE cap to unveil your citrusy spirit while you enjoy the outdoors! This is possibly the coolest SURGE keychain to ever exist as it shouts SURGE on the click of its button. Brand new batteries installed and comes with an extra set because let's be honest, you're probably going to be clicking that SURGE button everywhere you go to help spread the word! Originally given away in 1998 as a prize for finding a red SURGE bottle cap that read, "YOU WIN SURGE CD," this disc contains an arsenal of fully loaded tunes and audio samples for crafting superb mix tapes. Includes music videos for Fatboy Slim's "Going Out Of My Head", Fluke's "Absurd," and a commercial for SURGE. This super rad promotional CD was released in 1996 and features the following track list: Seventeen (Jimmy Eat World), Shoelace (Little John), Another Sunday (I Mother Earth), C'Mon Everybody (US3), Electric (Luscious Jackson), Watch the Fat Man Swing (Skeleton Key), Looking For (Stir), Killer Hair (My Head), Vitamins (Supernova), Bella's Birthday Cake (Five For Fighting), Kid (Silverjet), Dancin' At 7 (The Hazies). These sweet '90s-style bracelets were given away on SURGE L.A. Day with Pauly Shore at the SURGE sampling event at Third Street Promenade in Santa Monica. Photo credit for the event goes to Christine Switzer. This is a new officially licensed SURGE Hacky Sack. Still have your skills? Find out if this legendary sack is drawn in your name. This is a new officially licensed SURGE Can Koozie. Some actually prefer their SURGE warm, but if you do not fall into this category, we hope this item becomes yours. Don't freeze your hand and KEEP YOUR COOL SURGE COLD! These rare stickers are sweeter than a ticket to Willy Wonka's Chocolate Factory! They shine with brilliance and have a notable texture, featuring the crushed 12oz can of our youth. Produced in 1997 and in mint condition. Chances are, you've probably seen this shirt for years and always wanted one. Along with the giveaways above, these lucky 22 people will take away the Official SURGE Super Fan T-Shirt! Photo credit goes to Marc Andrew Stephens Photography, The Fergus Falls Journal, Dave Wallis of The Fargo Forum, & J. Alan Paul Photography. 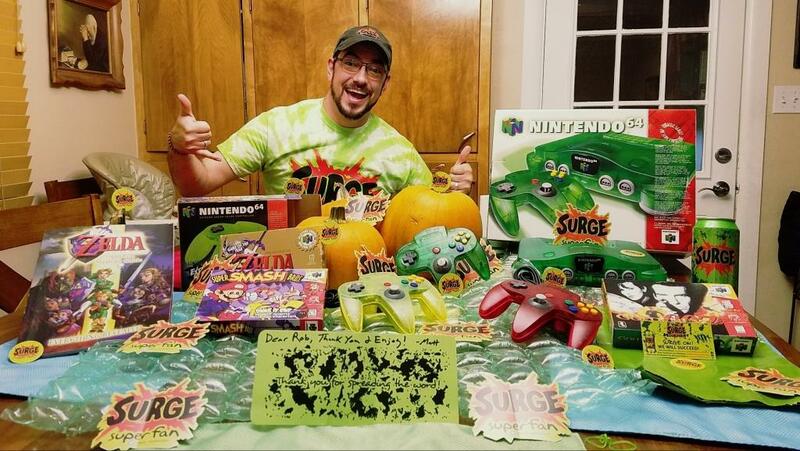 And last but not least - with a total of 164 final giveaways - here's your best chance to own a set of 10 SURGE Super Fan POGS! I agree that I am contributing to solely benefit a fundraising effort for SURGE Movement, LLC and understand the Summer '16 Fundraiser is in no way affiliated with or endorsed by The Coca-Cola Company. I acknowledge that the giveaways are only being offered as a gesture of goodwill for the campaign's contributors and I will have no expectations that receiving a giveaway is guaranteed or that any giveaway must meet or exceed a certain standard of condition or quality than represented in the provided pictures or description. I recognize my contribution is nonrefundable and that it strictly adheres to the “Digital Goods, Contributions, and Donations” terms of the Return Policy. Each dollar contributed in the Summer ‘16 Fundraiser under a single logged in surgemovement.org User Account will qualify that User Account holder an entry toward the Summer ‘16 Fundraiser giveaways. Multiple contributions under the same surgemovement.org User Account will be combined. If User Accounts are not created and logged into at the time of contribution, they will be created for you after checkout. There will be a maximum of one giveaway per User Account. SURGE Movement, LLC retains the right to disqualify contributors believed to have taken advantage of this ruling with instances of Multiple User Accounts. User Account contribution totals will be kept private, even during the selection of giveaways, e.g. it will not be disclosed if the selected Grand Giveaway User Account Holder donates the $1.00 minimum. *In the event that the value of all expenditures have not been covered by the number of contributions or if SURGE Movement, LLC determines it will be operating at a loss, a Fundraiser Duration Extension may be decided at any date at their sole discretion. The Official Rules of the Summer ‘16 Fundraiser may be amended, modified, or revoked at any time and for any reason.